Captain Matthew Paradise enlisted in the Navy in 1985 and attended Basic Underwater Demolition School class 138. Upon successful completion, he was assigned to Seal Team TWO where he made deployments to Northern Europe as a mountain and arctic warfare specialist. During his tenure at Seal Team TWO, he earned instructor qualifications in Combat Swimming and Mountain and Arctic Warfare. In 1989, Captain Paradise was selected for the Enlisted Commissioning Program and attended the University of Washington earning a degree in Electrical Engineering and a commission in August 1992. Captain Paradise attended primary flight training in Corpus Christi, Texas and advanced flight training in Kingsville, Texas earning his wings in July of 1995. In July of 1996, Captain Paradise completed initial training in the F/A-18 and was assigned to VFA-22 where he made two Western Pacific deployments and participated in Operations SOUTHERN WATCH and DESERT FOX. Captain Paradise was selected to attend USN Test Pilot School, graduated with class 117 in July 2000 and was assigned to VX-23 in the Carrier Suitability department. While at VX-23, Captain Paradise was both Project Officer and Project Pilot for numerous programs including Joint Precision Approach Landing System, and F/A-18 E/F degraded flight control carrier suitability testing. While at VX-23, he earned his Masters degree in Systems Engineering from Johns Hopkins University. In January of 2003, Captain Paradise was assigned as Air Wing Landing Signals Officer for CVW-5 on the USS KITTY HAWK and flew flights in support of Operation IRAQI FREEDOM. In October 2004, Captain Paradise was assigned to VFA-192 as a department head. During his tenure at VFA-192, the squadron was awarded numerous accolades including two Safety “S” awards and the Department of the Navy award for Safety Excellence. In November 2006, Captain Paradise served his joint tour as Maritime Communications System Manager for NATO Communications Service Agency in Mons, Belgium. Following his joint tour, Captain Paradise reported to VFA-34 as the Executive Officer and assumed command in May 2010 deploying aboard USS Abraham Lincoln in support of operation ENDURING FREEDOM. In January of 2012 Captain Paradise reported to Naval Nuclear Power Training Command in preparation for his assignment aboard USS George H. W. Bush and reported aboard in July of 2013, serving as the Executive Officer until July of 2015. Captain Paradise’s personal decorations include the Defense Meritorious Service medal, two Meritorious Service medals, five Air medals including two with combat “V”, three Navy and Marine Corps Commendation medals, a Navy and Marine Corps Achievement medal and various campaign and unit citations. He has accumulated over 3100 tactical jet flight hours and 900 carrier landings. U.S. 7th Fleet flagship USS Blue Ridge (LCC 19) arrived in Mumbai, India, April 3 for a regularly scheduled port visit to promote friendships and strengthen ties. U.S. 7th Fleet flagship USS Blue Ridge (LCC 19) departed Mumbai, India after a regularly scheduled port visit promoting friendships and strengthening ties with U.S. allies, April 7. Sailors aboard amphibious assault ship USS Boxer (LHD 4) took time, April 12 to reflect on the anniversary of the rescue of Capt. Richard Phillips from Somali pirates in the Gulf of Aden seven years ago. 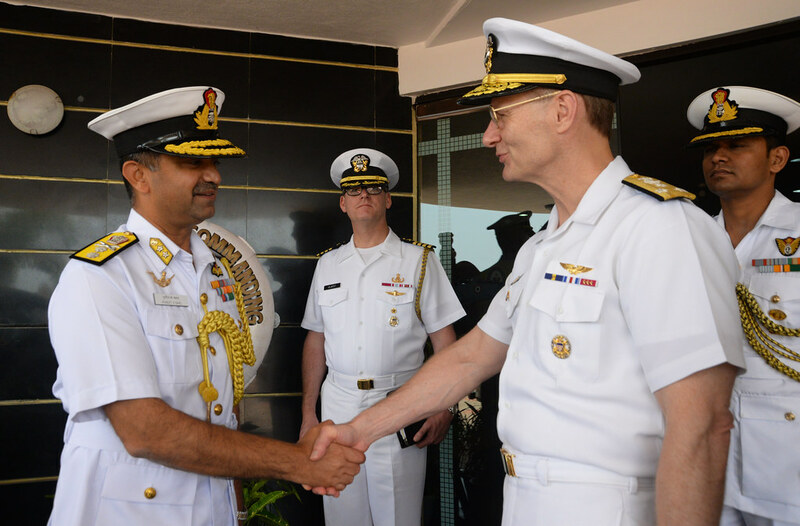 GOA, India - U.S. 7th Fleet flagship USS Blue Ridge (LCC 19) arrived in Goa, India, April 8 for a regularly scheduled port visit, promoting friendships and engagements with theater partners in the region. PHUKET, Thailand (NNS) -- USS Blue Ridge arrived in Phuket, Thailand for a regularly scheduled port visit, allowing Sailors a time for rest and cultural exchange April 18. HONG KONG (NNS) -- U.S. 7th Fleet flagship USS Blue Ridge (LCC 19) arrived in Hong Kong for a port visit during its 2016 patrol season, April 29. YOKOHAMA, Japan (NNS) -- After more than 80 days, U.S. 7th Fleet flagship USS Blue Ridge (LCC 19) welcomed family and friends aboard for the final stretch of it's 2016 patrol cycle May 16. My 36 years as a naval officer have taught me that warfighting comes first. U.S. 7th Fleet flagship USS Blue Ridge (LCC 19) entered dry dock at Naval Ship Repair Facility and Japan Regional Maintenance Center (SRF JRMC) to begin its scheduled extended dry-docking selected restricted availability (EDSRA) period after a successful spring patrol June 1. Members of the U.S. Command 7th Fleet and the U.S. 7th Fleet flagship USS Blue Ridge (LCC 19) combined Chiefs’ Mess commemorated chiefs on the 124th birthday of the U.S. Navy chief petty officer by observing evening colors at Commander Fleet Activities Yokosuka April 1, 2017. 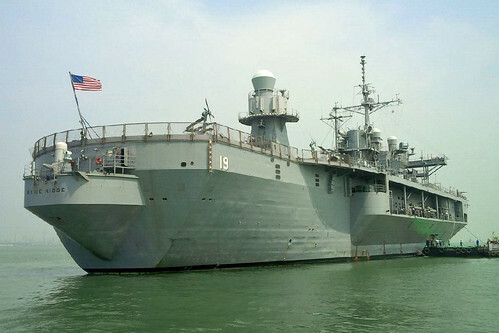 YOKOSUKA, Japan – U.S. 7th Fleet flagship USS Blue Ridge (LCC 19) became the first ship of its class to obtain a large-scale upgrade to its network infrastructure in March. The installation significantly increases internal communication, ship security and an overall standardization for meeting the requirements of modern day operating systems.